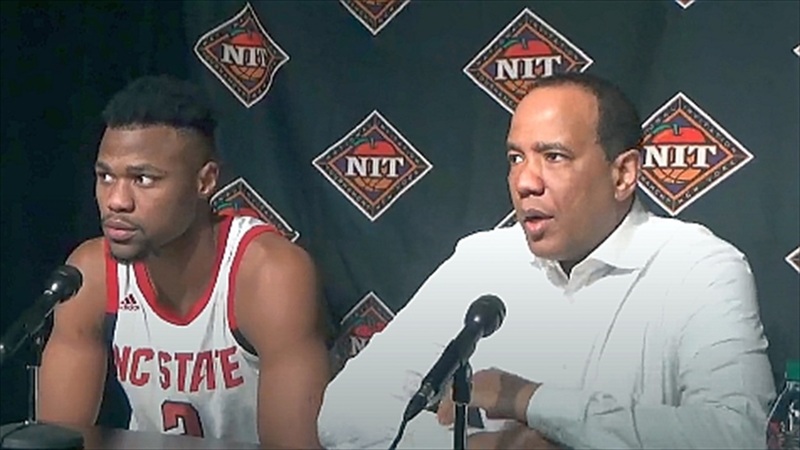 NC State head coach Kevin Keatts and senior guard Torin Dorn met with the media after the 94-93 loss to Lipscomb. “First of all, I would love to thank our passionate fan base. When you talk about us making the NIT and playing three electric games in this building, our fan base turned out and was incredible for all three. That says a lot about our fans and how passionate they are. “Second, I’d like to thank my players. We went 24-12 this season and I don’t think there was a game out of those 35 games that there wasn't a maximum effort, win or loss. Sometimes the ball didn’t go in, and we had highs, and we had lows. We had one game where we scored 24 points. “Every single time we stepped on the floor, those guys competed for me. We are trying to establish a great culture, and I think we are moving in the right direction. My coaching staff did a tremendous job preparing these guys. Their families and parents of these young men have worked hard to lead me to coaching their kids. “That being said, what a great game to watch. It was a tremendous offensive game. I felt like whoever had the ball the last time would have the chance to win it. I thought Markell Johnson made a great play down the stretch to give us the lead, and their point guard did the same thing. He had a great steal at the end and then made a play to win the game. “He has meant a lot to this program. I have taken a 6’5” guy and asked him to be successful in the ACC as a big guard and power forward. He has embraced that role and played extremely hard. He led us in both rebounding and scoring. “I think the thing that stands out about him is that as good of a basketball player is, he is an even better person. He is an ambassador for NC State. He believes in the brand of NC State. He is everything you think about culture when you think about a young man that is already graduated and is working on another degree. You never have to worry about him off the court. He does all of the right stuff. He has matured right in front of our eyes. He was a disappointed young man when I took the job because the year before he had a really good non-conference, but when conference came around he didn’t have the same opportunities. To see him play his last game and be aggressive, scoring 34 points in an electric arena, it means a lot to me. When we all get in this business, we want to know that we are sending young men into the real world ready. I don’t know if there is another young man in the world that is more ready than Torin Dorn. “One of the things I wanted to do tonight was keep the pressure on them and break them down. I felt like Markell had backed up to half court at the beginning of the second half. “He has grown so much. I know you guys remember when Markell Johnson came to school. Anybody can look at him and see that he has taken big strides. He has taken strides on the basketball court, in the classroom, and on campus. I am harder on my point guard because I expect those guys to be an extension of me on the court. Anytime there is a breakdown, whoever is running the point at the time is going to be the guy that is going to get it. Dorn: “Who shoots better, me or coach? Me of course. Last time we played the shooting game ask him who won.